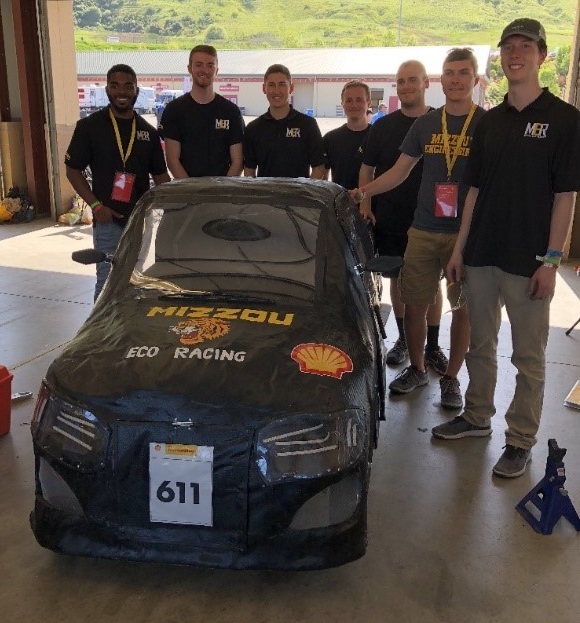 Our organization seeks to develop and promote the practical application of alternative energy while providing a real-world design experience for engineering students at the University of Missouri. 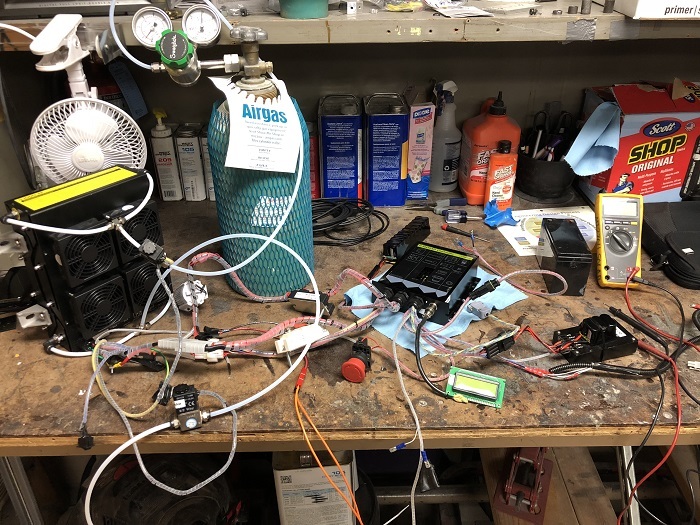 To this end, our organization designs, manufactures, and races an automobile powered by hydrogen gas against vehicles from other universities both in the U.S. and around the world. All of our engineers work across departments to bring TigerGen IV to life. This allows them to learn from each other and gain skills outside of their area of study. In addition, our team is active in promoting fuel cell technology around our extended community, at venues that encourage higher education, and green energy. In this way, our team can expand on the knowledge gained from six generations of solar car teams and three generations of hydrogen teams. We use it to build and promote technologies that have the ability to lead us to a sustainable future. We are open to all majors, graduate and undergraduate students; team members devise business plans, fundraise, and manage their own publicity. 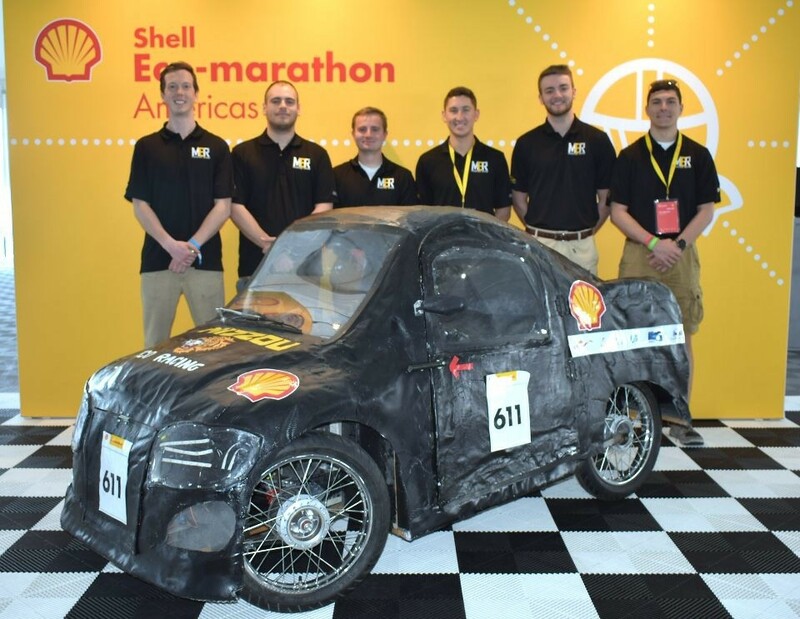 This spring, Tigergen IV participated in the 2018 Shell Eco-marathon in Sonoma, California. 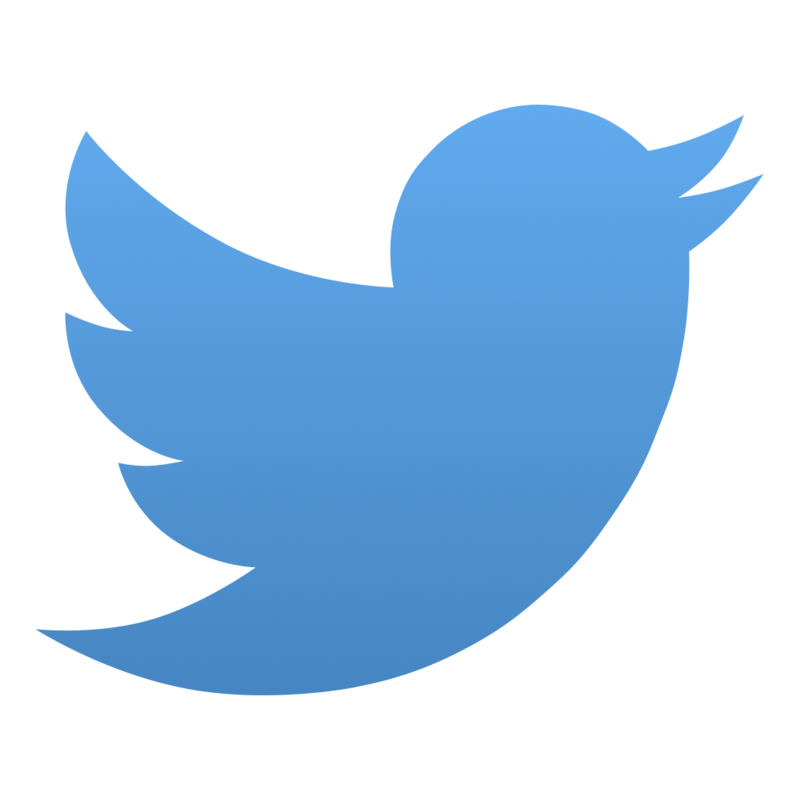 For more race information, click here. The Hydrogen Fuel Cell is a complicated piece of equipment. It turns a hydrogen fuel supply into electricity along with water as the reaction output. 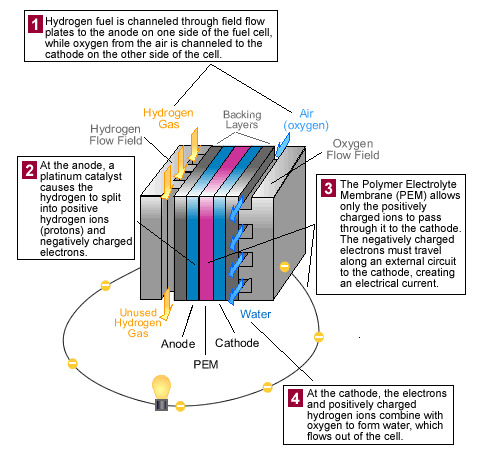 The fuel cell stack utilizes a PEM (Proton Exchange Membrane AKA Polymer Electrolyte Membrane), and the below diagram explains the stack’s functionality well. 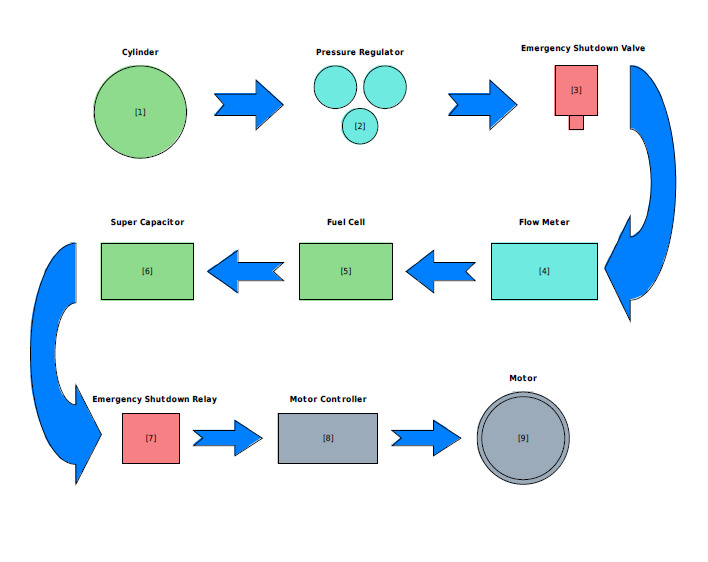 This is the complex functionality of our vehicle’s power source broken down into a simplified diagram, however it is only a small piece of the vehicles energy supply. The energy supply actually consists of multiple components, both for energy supply purposes as well as safety precautions when dealing with the hydrogen. A diagram of our vehicle’s energy supply can be seen in the figure below. The hydrogen cylinder contains compressed 99.99% purity hydrogen gas, and it is securely attached within the energy compartment of the vehicle. Directly connected to the hydrogen cylinder is the pressure regulator. The pressure regulator allows us to control the amount of hydrogen being released from the cylinder. With our fuel cell stack, we run the hydrogen supply at 0.5 bar gauge pressure. The pressure regulator feeds into an emergency shutdown valve, which we have implemented as a solenoid valve. The solenoid valve will normally be closed, shutting off any flow to gas through the system, until the solenoid is energized which will flip the valve open and allow the flow of hydrogen. This is a safety precaution for the system. Once the gas has passed the solenoid valve, it flows through a flow meter. The flow meter is useful in determining exactly how much hydrogen gas is being fed to the fuel cell. From the flow meter, the hydrogen flows directly into the fuel cell, and that is where the power is created. 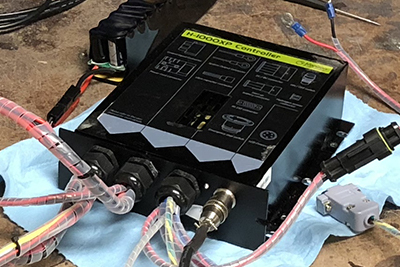 As an additional component for the energy supply system, the fuel cell has an integrated super capacitor, which will store power from the fuel cell that can be used to drive the motor forward. The fuel cell’s generated power is fed through the motor controller, and then directly to the motor. This is what drives the vehicle forward. All of these components hooked up just as it would be inside the vehicle are shown in the figure below. 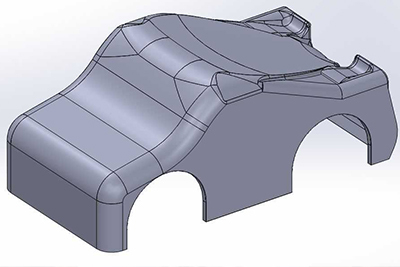 The chassis is one of the most important projects for the vehicle. It is the backbone to the structural integrity of the vehicle, and is the main frame that key components such as the suspension systems and roll bar for driver safety. It is also a very good way to base all of the vehicle’s dimensions off a structurally sound metal frame. The chassis is made of all steel tubing, and welded together by mechanical engineering students. The chassis undergoes FEA as well to ensure no failure in the structural integrity of the vehicle. 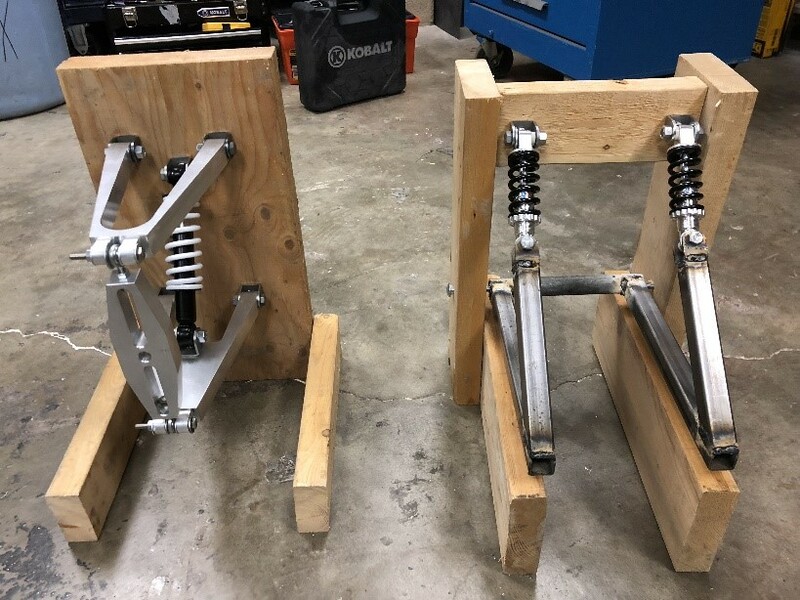 Our front and rear suspensions are designed and built all by our mechanical engineering students. 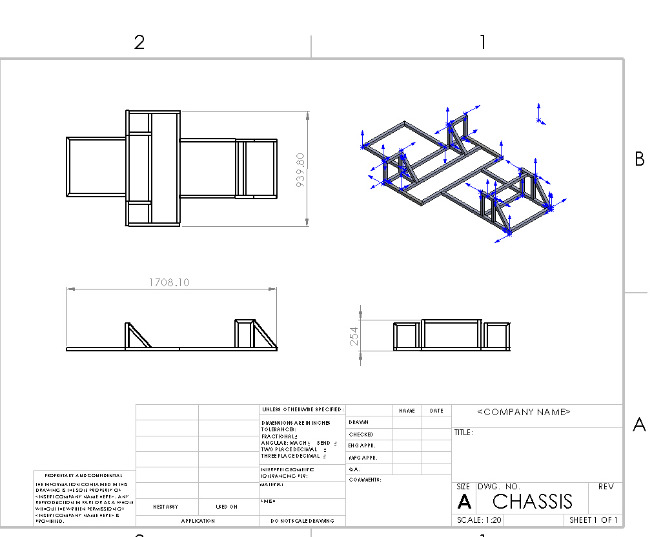 We design everything in 3D CAD programming, and conduct FEA (Finite Element Analysis) before manufacturing and assembly. Other than the spring dampeners, all of our suspension components are made by hand from aluminum stock and steel tubing. Everything is machined on a mill or lathe, and then welded together where needed. The Finite Element Analysis distinguishes the points of interest in the suspension designs, and ensures that the final assembly will not exceed its material’s yield strength and fail. 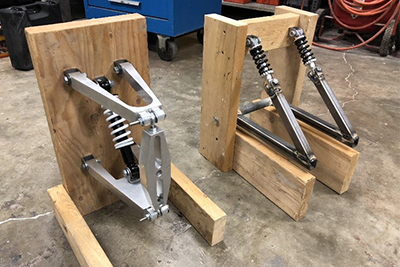 In preparation of integrating the suspension systems into the chassis, the suspensions are assembled individually from the vehicle. This gives us precise hands on dimensions of the suspensions, and makes it easy to attach to the chassis and vehicle. The team constructs its vehicle’s body from start to finish. 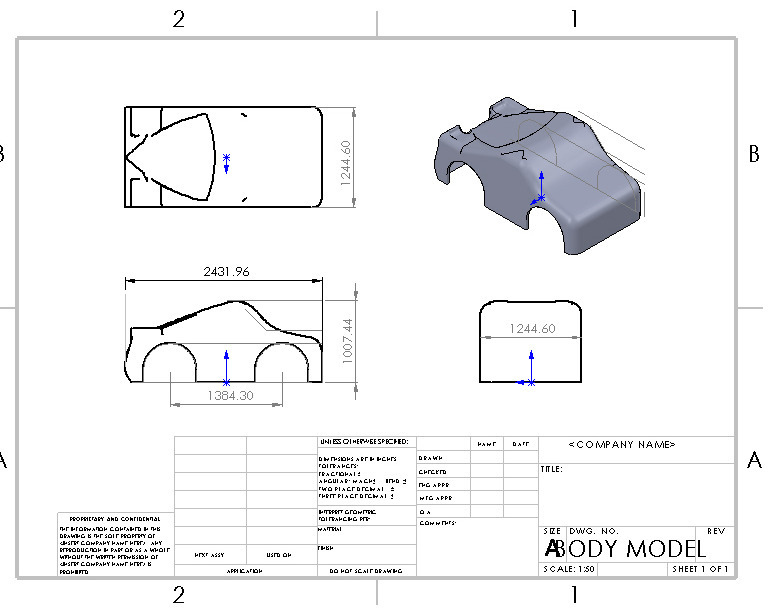 We begin with the design of the vehicle body drawing it up in Solidworks. 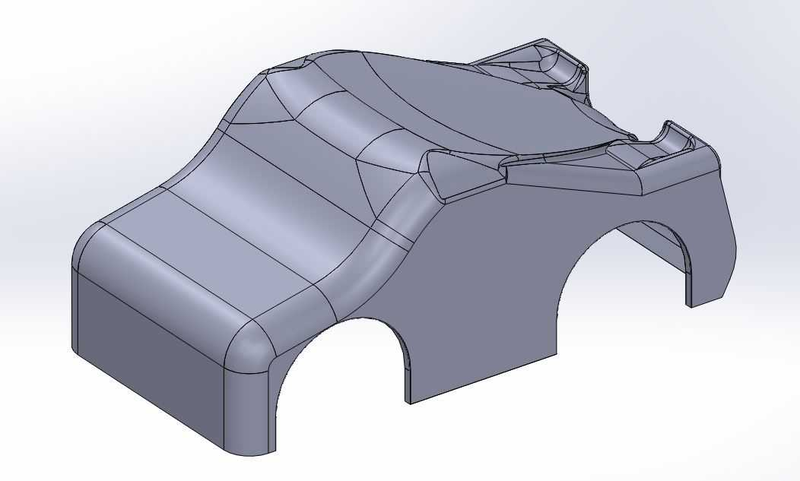 We design the car to be the dimensions needed for competition, and include the curves and contours necessary for optimal aerodynamics. With TigerGen lV, we made the mold from our CAD design out of clay and sculpted it by hand. This was great hands on design work for everyone on the team. Once the mold was created, we were able to begin forming the body with composite material. In the construction of the body, we utilize carbon fiber and nomex for its high strength and lightweight characteristics. The nomex is sandwiched between epoxied carbon fiber sheets, and laid down in the mold made from the clay. In order to conform the carbon fiber to the shape of the mold, we vacuum bag the carbon fiber. 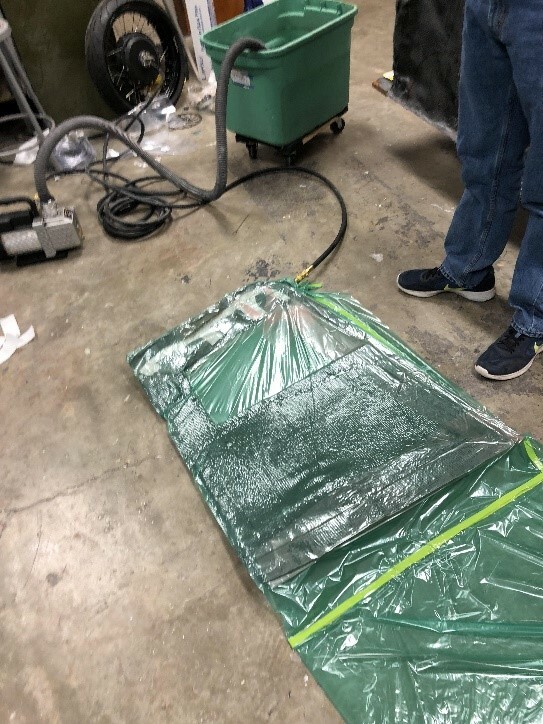 This means that we vacuum out all the air inside the sealed off bag, so that the carbon fiber conforms nicely to the vehicle body mold. As the epoxied carbon fiber cures, it will harden in the shape of the constructed mold. Once fully cured, we pop it out and have our body. 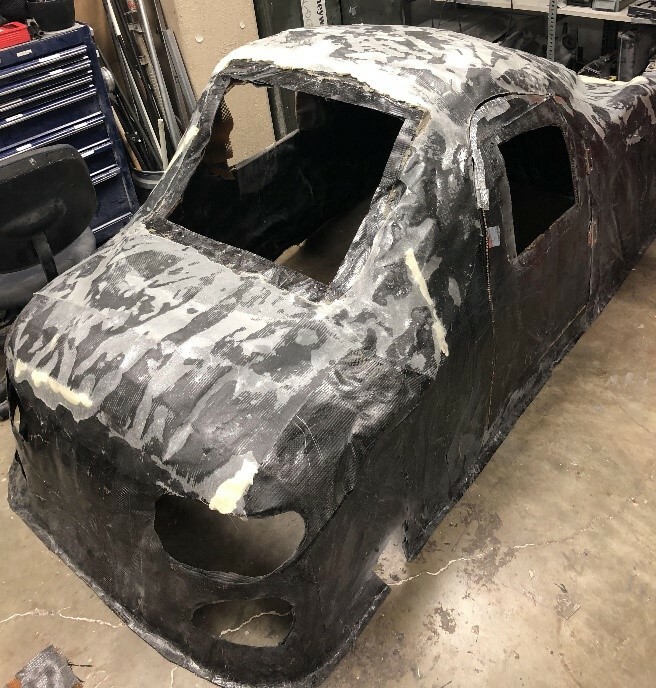 For additional body work, we are able to utilize carbon fiber and fiberglass as patchwork for the vehicle body. Our start to finish process for constructing the body is one of the most valuable skills to have as apart of this team. We all gain hands on experience with composite materials, which becomes a rare and valuable skill to have as an engineer. Building a Formula SAE electric racecar is an expensive task. Thanks to the sponsors above, we were able to successfully convert a Chevy S10 to an all electric vehicle. 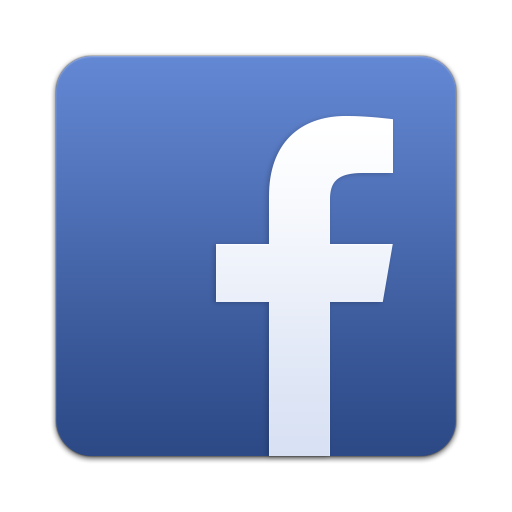 Please considering joining them in sponsoring our new competition build team as we dive head first into the FSAE Electric arena. Any help is greatly appreciated, whether it is in the form of products, services, or just cold hard cash. Any sponsorship inquiries can be sent to mizzouecoracing@gmail.com.